Welcome to Craft. 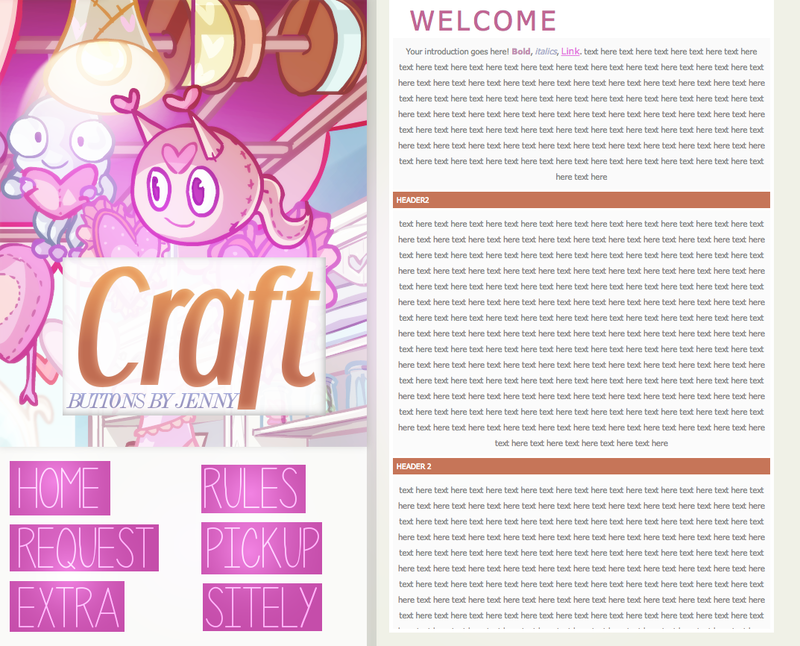 Craft is a button request site currently run by Jenny. Established on the 23rd of February 2014, Craft started accepting requests. If you have any questions or concerns, please don't hesitate to send me a neomail. My inbox will always be open. Best Viewed In: Google Chrome. Like Craft? Please rate & comment for Craft at the following sites. 17.12.15 @ 2:20PM Wow... It's been over 6 months since I last updated. During that time I've honestly lost interest in the entire game which made me lose interest in all the aspects within the game (mall,pages). I will create buttons for any sites. I will only create buttons with neopets images as I find it difficult to work with colours on non neopets images. You may request again after your request is finished and as long as requests are open. I will always respond to your neomail whether it was accepted or rejected. If I have not replied within 2 – 3 days please resend your form. Linking back is mandatory, I will accept 2 types of link backs: The button itself to link back to Craft, and a visible text linking to Craft. I will not create any graphics for neopians with stolen content/layout. If I find out that you have done so I will immediately contact the individual you have stolen it from. If you have read the rules please put the word popcorn somewhere in your form. Please double check that the request option is open, If you happen to request while requests are closed I will kindly decline your request. Custom button: Is where you can choose all the aspects of your button to create your ideal button. See request status? Jenny's Pick: Here I have more freedom on how your button shall look, you can give me an idea but the rest is my choice. See request status? Beginners bundle: Is a pack of 3 buttons for beginner sites with less than 5 buttons. You can give me a theme on what you would like it to look like but the rest is up to me. See request status? Packed Package: This choice is for those who would like to request 4 buttons. These buttons are completely up to the designer. See request status? The 3 R's: This choice is the 3 R's reduce, reuse, recycle. You will be able to take a look at my button portfolio and choose a button you like I then incorporate that buttons design/idea into your button. See request status? If you know exactly how you want your button to look or you just want to test your imagination then the custom button request is for you! Browse through the options and fill out the form before sending it in! Note: Please think about the amount of space required eg, Always is a big font and will only work with one word. Although you can use 2 fonts eg. Headlines at the top and 04b03 at the bottom or Capital porkys 'S' and 04b03 'mile'. If you're not too sure on how you would like your button to look then the designers choice request is for you! Are you new to the site community? Need some button to get you started? Use this request option! Beginner's choice button allows you to receive 3 buttons! To be eligible for this request you must have no more than 5 buttons on your site page. Do you like to receive things in bulk? Need a few extra buttons? Use this request option! Like another button design? Like the same text structure? Use this request! View all of the graphics I've made since starting Neopets. (external link) View? Learn more about Jenny and what she does on neopets as well as in real life. (external link) Learn more? Learn more about craft and its goals set since its opening.Continue? View all of Crafts achievements and awards given from fantastic sites. More? Check out the frequently asked questions before asking your question. Maybe its been answered already! Read more? Don't want to request? Check out the premade buttons made by Jenny. Continue? Lets go back in time and view Crafts older layouts. Read more? Need to learn something? Check out Crafts tutorial maybe we covered it already if not suggest a tutorial! Proceed? View all the comments received from neopians. View? Note: Questions will be added as soon as they are asked. Has one of Craft's tutorials helped you? It would be great if you linked back! Hey, Today I will be teaching you how to create the shine animation on buttons using gimp. After you got that all sorted drag your cursor across the part of the transparent layer the thickness of the lines depends on how far you drag your cursor. The farer you drag the thicker the line. You can create your lines at various angles. Move your first shine layer to the edge of your button (In this case to the left). Duplicate the shine layer and move it a bit more to the right. Duplicate it and move it more to the right and so on until you have reached the other end of the button. Once you have completed the shine layers, duplicate your button layer underneath each shine layer. So that it becomes: Shine Layer, Button Layer, Shine Layer, Button Layer and so forth. Keep one of your button background so that there is a some space between each shine. Merge 1 Shine layer and 1 Button Layer so that it becomes one. Continue doing this with the rest of the layers making sure that there all merged. Make sure you have one button layer that has no shine on it, this will be used as breathing space between the shine. After everything is merged you should have one layer that has no shine on it. Duplicate this as many times as you need you feel is needed, in my case I have duplicated it 8 times. Now for the last part go to filters - animation - playback to view your button as if it was animated, if your happy with the results go to file - export as - in the pop up box select as animation and loop forever. With Jenny making a site for button and banner requests. This button surely caught my attention. Despite that she always has been making banners and buttons for me and for our mall, surely with her new link back button with the dark themed style of Eliv Thade, and the animation of showing a light in this dark button! It really captured my attention! Craft officially opened its door on the 23rd of February but before then Craft was named Define. I renamed Define after a hiatus also because I did a complete revamp. Crafts theme is a workshop for clothing where you sew things together and design the completed outfit. Craft is currently accepting requests! Request Today! Hey I'm Jenny owner of craft, a button request site. Here at craft I try my best to offer you the best buttons I can possibly deliver within a timely manner. If you have a problem, question, or you just want to chat post it below or send me a neomail http://www.neopets.com/~Calcaxonia Visit the link above to visit craft! Can't wait to hear from you. I don't like using prewritten neomails, but when I do use them these below is what I use. Great for quick and easy button making. View? Need to put a button placeholder? Different texts and colours great for your various needsLearn more? Let people know what your collecting!.Continue? Show people what you willing to lend and what you would like to be lended. More? Great for any holiday seasonSee more? Neomails have been used with the neopians permission. Please drag and drop the image to your address bar for the full size. To apply send me a neomail. Brief description on how amazing the site is. Dianna at Coastal Codes for the layout template. Background in header from Charlies SWF. PNGS from Aroma & Details. Back arrows, Request signs, button placeholder and counter base from Bedazzled. Emma at Impulses Tutorial for getting me started on my button making. All Content From Jenny unless stated otherwise. Have I forgotten to credit you? Please Neomail me right away.